At the reopening of the renovated Norton Museum of Art earlier this month, Norman Foster revealed his two points of inspiration for the project: an existing banyan fig tree and Claes Oldenburg and Coosje van Bruggen's Typewriter Eraser, Scale X sculpture from 1999. Both elements were crucial to the architect’s intuitive redesign and reorientation of the museum’s entrance. The new west-facing forecourt features a 43-foot-high metal canopy with a scalloped cutout that cuts around the towering tree. Within the shaded hollow the overhang creates, an embedded reflecting pool surrounds the massive sculpture. This careful approach carries through the entire project. 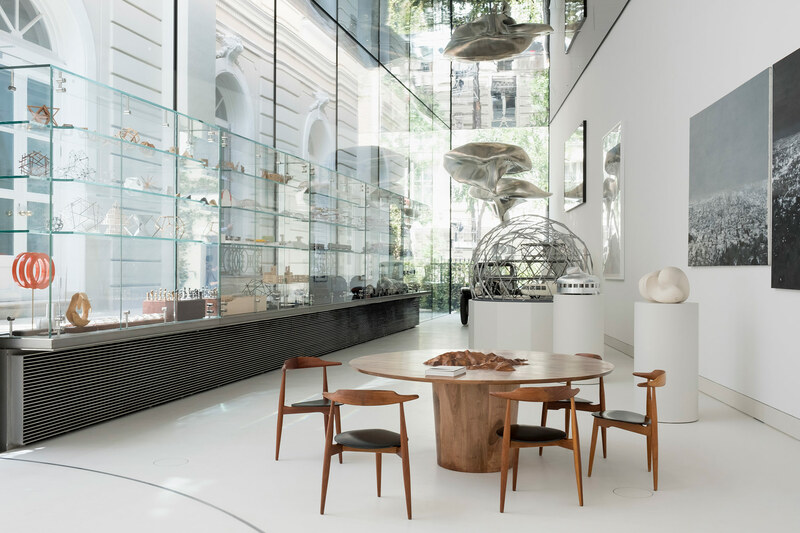 Rather than create another statement-piece museum where the architecture steals the show, Foster + Partners opted for a contextual approach that spotlights the Norton's vast collection. Adding over 12,000 square feet to the original 1941 Art Deco building, the firm introduced a 210-seat auditorium, the museum’s first restaurant, and additional gallery spaces. Major extensions include the new 3,600-square-foot, double-height Ruth and Carl Shapiro Great Hall, featuring a unique concave skylight. The 150-foot-long, glass-walled Ira and Nicki Harris Family Gallery extends from the former south-facing entrance. This addition flanks a covered promenade and a new sculpture garden. Occupying what was originally the Norton Museum of Art’s main 20,000-square-foot parking lot, the green space is Foster’s first ever public landscape project. The sculpture garden divides into two curated "rooms." Native plant species were spread throughout to highlight the museum’s subtropical surroundings. Foster + Partners' renovation blends new and old components with a minimalistic, all white, stone facade. The firm also restored the museum’s existing galleries and six historic artist residence homes, located nearby. The redesign champions historic architectural detailing while also introducing large light-filled voids. The overall reprogramming of the space mirrors the Norton Museum of Art’s curatorial vision; some of the museum's key historical collections are dispersed between temporary shows. The museum places emphasis on exhibiting female, African-American, and living artists. The Norton Museum of Art officially reopened on February 9. This unveiling is only the first milestone in a 20-year masterplan that Foster + Partners has conceived for the museum. A new installation coming next year to New York City could be the strangest piece of visual art the creative capital has seen. British contemporary artist Marc Quinn has envisioned a sculpture made of human blood, intended as a commentary on the ongoing global refugee crisis. It’s set to debut on the steps of the iconic Fifth Avenue branch of the New York Public Library in fall 2019 in a Norman Foster–designed structure, and it will then embark on a traveling tour. Odyssey, as the work is aptly named, will feature two transparent cubes filled with one metric ton each of frozen human blood. The artwork will be the centerpiece of a nonprofit project aimed to help raise awareness and raise $30 million for refugee-support organizations around the world. Fifty percent of the project’s proceeds will directly benefit the International Rescue Committee, while the other half will go to charities and programs selected by Quinn’s foundation, Human Love. “The global refugee crisis is one of the greatest humanitarian tragedies we have seen,” said Quinn in a statement. “The idea for Odyssey began with the simple truth that my blood and your blood is the same; under the skin we’re all the same.” To demonstrate the concept that our blood unites us as humans, Quinn will draw donated blood from over 5,000 refugees and non-refugees alike to go inside the identical cubes. 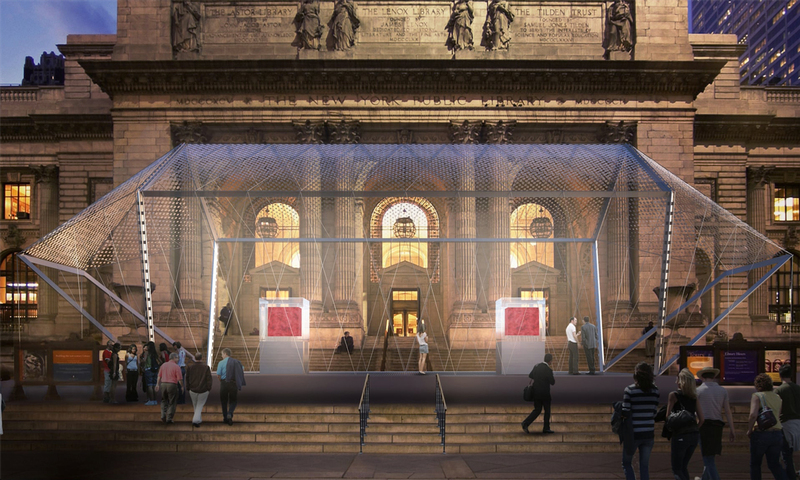 One cube will hold the blood of resettled refugee volunteers while the other cube will hold the blood of celebrities such as Jude Law, Bono, Kate Moss, Paul McCartney, and others. The cubes won’t be marked, so it’ll be up to viewers to reflect on the similarities between the two. Quinn is slated to begin gathering the blood this January by stationing small laboratories in cities across the world, all set up to match medical and ethical standards, according to The Guardian. Every person who donates blood will be able to contribute a short video message about their reasons for joining the effort. Refugees will have the opportunity to share their past traumas and bring attention to those still in crisis. Odyssey will go on tour around the world after its initial stint at the New York Public Library. The accompanying footage will be displayed across public screens and billboards throughout the host cities. In addition, the artwork will be displayed inside a steel-framed pavilion designed by Sir Norman Foster and backed by the Norman Foster Foundation. Foster noted the difficult yet poignant task of creating a traveling structure for this invaluable piece of art: “Art can raise issues of equality and inequality. That has to be one of the functions of art,” he said. “In Odyssey we had a challenge: to create an environment that will work with the two frozen cubes of blood and be able to adapt to radically different locations and climates. This challenge is primarily architectural but is also an environmental one. “In a way, perhaps that diversity of situations also highlights the diversity of the refugee crisis; it is not confined to one continent, nor to one kind of people. It’s universal—much like our humanity. We are all the same, under the skin.” Anyone can donate blood or money to the project. Visit bloodcube.org for more. As the link between the alleged killing of Washington Post journalist Jamal Khashoggi and the Saudi Crown Prince Mohammed bin Salman grows stronger, leaders in many sectors, including in media and design, are distancing themselves from projects and conferences sponsored by the regime. This includes architects and design leaders on the advisory board of NEOM, a $500 billion megacity project announced last year at an international investment conference held in Riyadh, the Saudi Arabian capital city. 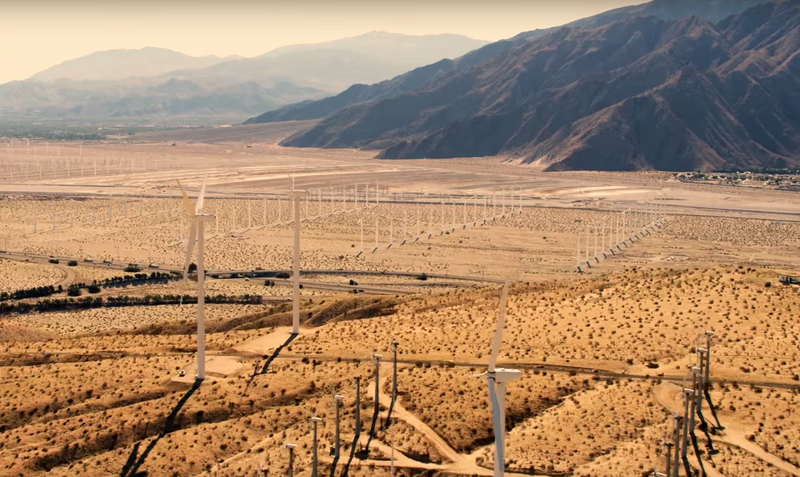 NEOM is envisioned as a "smart city" rising on 10,000 square miles of desert with a separate governance structure and ambitious energy, tech, and sustainability goals, part of a larger "Saudi Vision 2030" plan intended to help move the country away from its dependence on oil revenue. The development's website advertises the city as one that "heralds the future of human civilization by offering its inhabitants an idyllic lifestyle set against a backdrop of a community founded on modern architecture, lush green spaces, quality of life…" and so on. The project posits modern architecture as a key part of what it means to live in the future. On October 9, an official announcement named notable leaders in the field who would participate on NEOM's advisory board. They included Sir Norman Foster, Carlo Ratti of MIT's Senseable Cities Lab, IDEO president and CEO Tim Brown, Sidewalk Labs chairman and CEO Dan Doctoroff, and Travis Kalanick, former CEO of Uber. The initial list also included Jonathan Ive, Apple's chief design officer, but his name was quietly removed from the initial list of 19 names soon after it was released. The announcement came a week after the October 2nd disappearance of Khashoggi, who was last seen entering the Saudi consulate in Istanbul, Turkey, with numerous news outlets reporting that he had most likely been killed there by Saudi agents, which the Saudi government denies. Since the initial announcement about the board, Doctoroff stated that his inclusion had been a mistake, and Brown also withdrew himself soon after. It appeared that Foster and Ratti were the few holdouts from the architecture world still left on the board. But today, Foster's office told AN: "Earlier this week Lord Foster wrote to the head of the NEOM Advisory Board stating that whilst the situation remains unclear he has suspended his activities in respect of the Board." Ratti's office offered this comment, "Both Carlo and our team are gravely concerned about the Khashoggi case. We are monitoring the situation closely as it develops hour by hour. We are waiting for the results of the U.S. investigation to evaluate the best course of action." With state department officials, major corporations, and media partners withdrawing from the conference where NEOM was announced last year and mounting global pressure to investigate what really happened to Khashoggi, it remains to be seen what impact this will have on any of the numerous deals and projects that have already been set into motion in Saudi Arabia. This not only includes massive undertakings like NEOM, but a range of built projects scheduled for completion later this year and the near future, including projects by SOM, Henning Larsen, and Adrian Smith + Gordon Gill Architects. 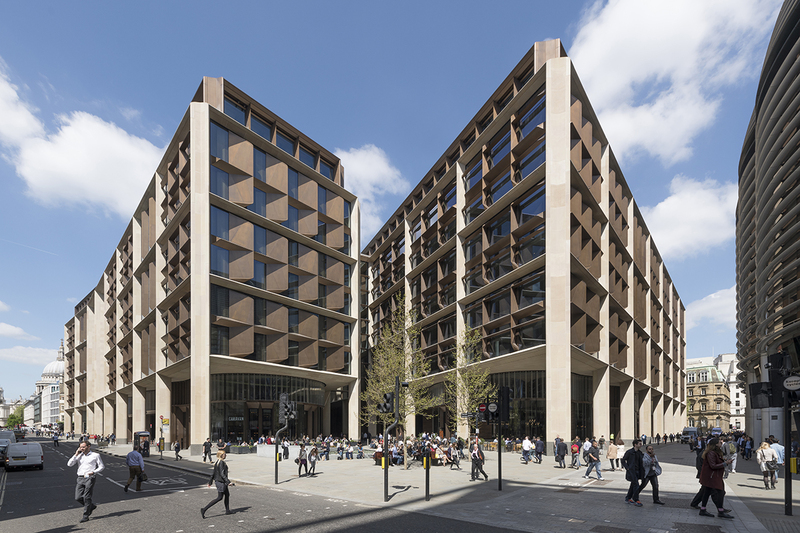 This week, Foster + Partners’ Bloomberg European headquarters in London picked up the 2018 RIBA Stirling Prize, an award ostensibly given to the best building in the U.K., marking the third time Norman Foster's firm has won the award. But was it actually the best piece of architecture on the shortlist of six projects? No. Let me start off by saying that the Bloomberg headquarters is by no means a bad building. The judging panel, chaired by Sir David Adjaye, was right to say the project “pushed the boundaries of research and innovation in architecture." They added in a statement: “Bloomberg has opened up new spaces to sit and breathe in the City,” and went on to laud “the visceral impact of the roof-top view across to St Paul’s from the concourse space,” the office’s helix ramp and its “dynamic new workspaces.” However, all of these listed items of praise are merely examples of pricey green gadgetry and fancy add-ons. While good in their own right, they have not come together well enough to form an exemplary piece of architecture worthy of winning the RIBA Stirling Prize. Inside, amid the myriad of seating, the scheme feels like a glitzy airport at times with stock markets being displayed on screens emulating departure boards. Views out are also hard to come by, besides one panorama of St Paul’s and a vista of the city reserved for Bloomberg's higher-ups as they dine. The Bloomberg HQ may have also carved a new thoroughfare through this part of London, but it’s hardly space to breathe. The public feels somewhat ushered through the massive slabs of sandstone by undulating bronze fins that dominate the facade, being employed further up to aid air circulation and shun views out in the process. The only spaces where you don’t have to be a paying patron at an establishment to sit are two benches at the site’s southern corner, both of which have seating dividers to prevent rough sleepers. Poor people it seems shouldn’t be allowed to rest when in the presence of a $1.7 billion building. And that’s the project’s biggest issue: money. “Some people say the reason it took almost a decade to build this is because we had a billionaire who wanted to be an architect working with an architect who wanted to be a billionaire,” said former New York Mayor Michael Bloomberg at his building’s unveiling. Norman Foster is the U.K.’s wealthiest architect. This year, partners at his firm shared $30.4 million between them, a 43 percent increase on last year despite a downturn in profits and turnover with the company having to lose staff in the process. As critic Oliver Wainwright noted in a tweet, Foster's 'non-resident in the UK for tax purposes' status prevented him from even picking up the award in person. What does all this say about architects and the profession? That to design a good building you must find a client with apparently limitless pockets? That as an architect it is more important to be obscenely wealthy over everything else? Bloomberg’s London HQ is a far cry from last year’s winner, dRMM’s Hastings Pier, which exemplified civic architecture at its best. That delightful scheme made extensive use of timber salvaged from a fire that burned down the previous pier. It was truly a community project. dRMM held close consultations with the public and the charity funding it, and the pier was built for the public of Hastings (and those visiting, of course). There were far better examples of architecture on this year’s Stirling Prize shortlist too. Take Waugh Thistleton Architects’ Bushey Cemetery for example. Using walls of rammed earth sourced from the site it rests on, the project demonstrates genuine material innovation and manages to convey a sense of weight and be delicate at the same time. Bloomberg, meanwhile, shipped in 600 tons of bronze from Japan and granite from India, and despite the similar earthy tones, feels dauntingly heavy. An example of working wonders when on a budget was also shortlisted: Storey's Field Centre and Eddington Nursery in Cambridge by MUMA. Like Hastings Pier, this was a celebration of civic architecture, with a community center and kindergarten surrounding a landscaped courtyard. “By building at a lower height than approved at planning…Bloomberg shows a high level of generosity towards the City,” the judges commented. In light of this, Jamie Fobert Architects’ Tate St Ives was arguably more adept at concealing space. Buried underground, yet still allowing bucket loads of light in, the museum has somehow doubled in size. It’s a remarkable piece of architectural contortion that keeps locals and the museum happy. Another shortlisted project, Níall McLaughlin Architects’ Sultan Nazrin Shah Centre for the University of Oxford, like the two aforementioned projects, articulated light in spectacular fashion. The project provided a lecture theater, a student learning space, seminar rooms, and a dance studio of immense quality and leads by example the quality of spaces students deserve. London studio Henley Halebrown’s Chadwick Hall student accommodation for the University of Roehampton, the final project on the list, did the same. A win for the project could have sent a message about what the standard of student housing in the U.K. should be. The majority of current student housing stock is dire. With space standards for student housing thrown out of the window due to it being temporary accommodation, the area has become a safe bet for investors looking to cram as many units in for a guaranteed profit. A message, in fact, was sent, coming in explicit form from RIBA President Ben Derbyshire. “This building is a profound expression of confidence in British architecture—and perfectly illustrates why the U.K. is the profession’s global capital,” he said in a statement. “This role and reputation must be maintained, despite the political uncertainty of Brexit.” This, however, feels like a lazy excuse to award a project the Stirling Prize. Defaulting to listing “Brexit” as a reason should not be in the criteria. Neither should sustainability, a high standard of which should be a baseline for all shortlisted projects. Let BREEAM (the U.K. equivalent of LEED) deal with recognizing that. The RIBA Stirling Prize doesn’t have to send any message, though. It just has to recognize the best building, and this it has not done. Following the reveal of the Asplund Pavilion, a precursor to the ten chapels that the Vatican will be presenting at the 2018 Venice Architecture Biennale, Foster + Partners has released renderings for the United Kingdom’s contribution. 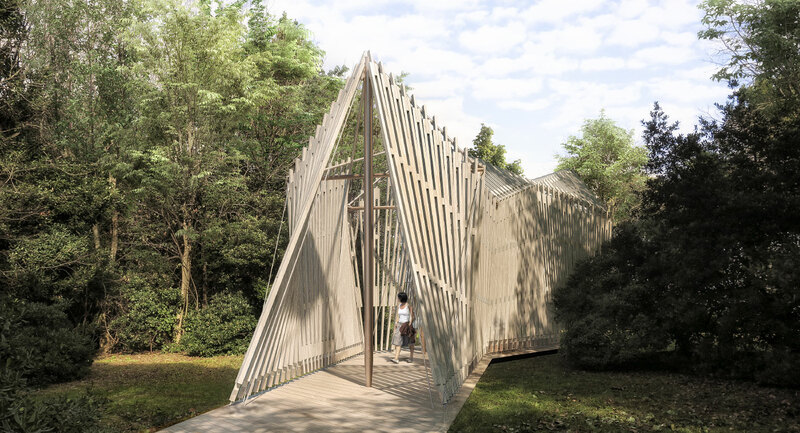 First announced in January, the Holy See’s pavilion, Vatican Chapels, will be built on San Giorgio Maggiore, a forested island across from St. Mark’s Square, and consist of ten temporary chapels meant to embrace the reverence of nature. The designs released by Foster + Partners show a serpentine timber pavilion that curves through the Venetian woods, with three distinct sections supported by cross-shaped structural elements. A series of perforated vertical slats will drape the exterior of the chapel, letting visitors glimpse the surrounding woodland while also dappling the interior with light and shadow. In a statement sent to AN, the final idea for the chapel arose from the concept of three symbolic crosses draped with a “tent-like membrane”; ultimately the crosses became anchoring masts and the membrane transformed into the lattice shown in the renderings. The chapel will be supported largely in part through tensioning between the different components. 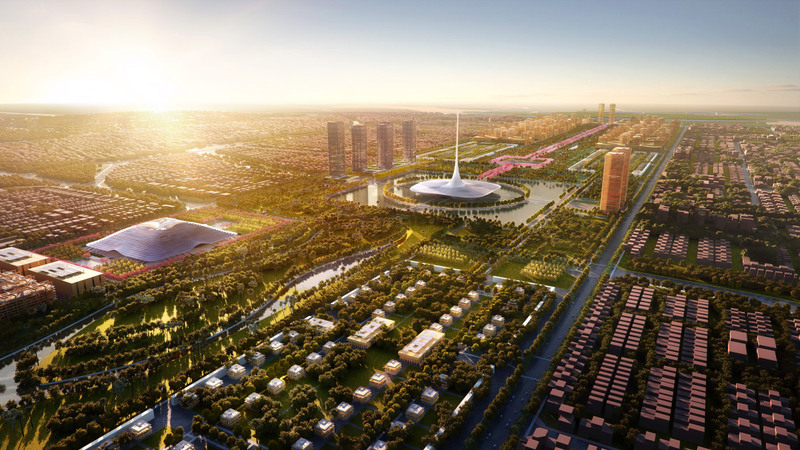 “Our project started with the selection of the site,” said Norman Foster in a statement. “On a visit to San Giorgio Maggiore, close to Palladio’s magnificent church and the Teatro Verde, we found a green space with two mature trees beautifully framing the view of the lagoon. It was like a small oasis in the big garden, perfect for contemplation. 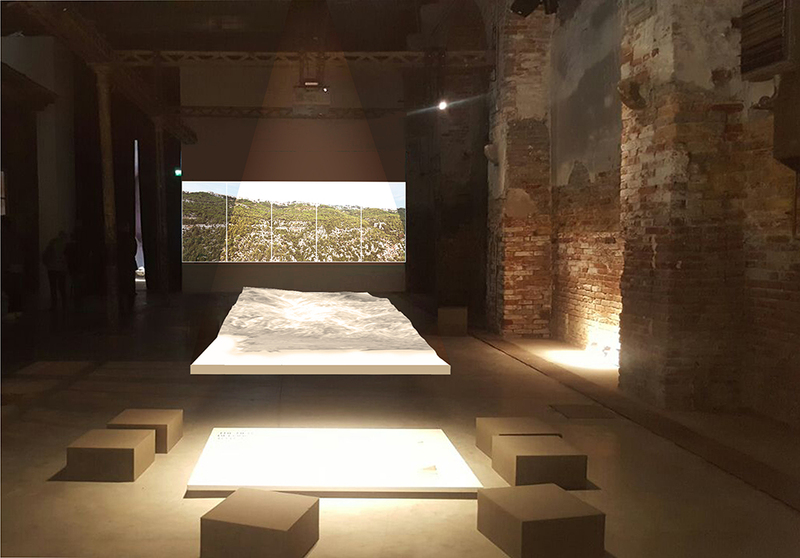 Our aim is to create a small sanctuary space diffused with dappled shade and removed from the normality of passers-by, focused instead on the water and sky beyond.” The 2018 Venice Architecture Biennale is the first time that the Vatican will be represented at the festival. In describing their design approach, the Church emphasized that the chapels–each built by a team from a different country–are meant to express Catholicism through that country’s unique history with the religion. After the conclusion of the Biennale, the chapels will be sent all over the world to serve in areas lacking dedicated houses of worship. Foster + Partners’ chapel is being constructed in partnership with Italian furniture manufacturer Tecno. The pavilion’s opening ceremony will be held on May 25, and will remain on display through November 18, 2018. 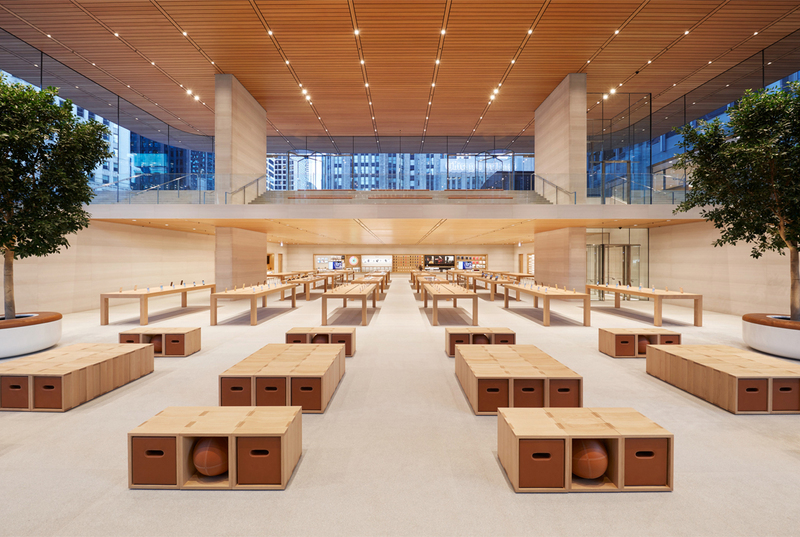 Norman Foster’s recently completed flagship Apple Store in Chicago, whose ultra-light roof meant designers could include plenty of unobstructed views, now seems unable to cope with the stress of a Chicago winter. Residents are reporting that the downward-sloping roof has turned the sidewalks around the store into a hazard zone, as ice and snow has been sliding off and potentially endangering pedestrians. According to 9to5mac and local blogger Matt Maldre, Apple has decided to address this problem by roping off all of the walkways around the store except for the entrance. 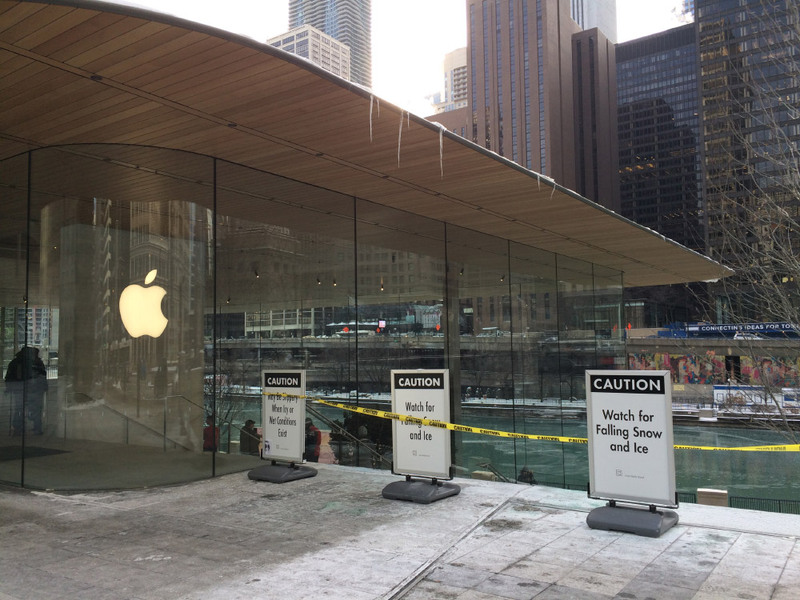 Because the store is sited on the bank of the Chicago River and meant to act as a "Town Square," Apple’s closure also means that the riverfront will be blocked off as well. The curved, 32-foot-tall glass facade that seamlessly wraps the store hasn’t gotten out of the cold weather unscathed, either. As one Skyscraperpage forum user noticed, the outer layer of the laminated glass paneling seems to have cracked because of the weather. Since each panel is produced in layers, the entire piece will need to be replaced, and definitely not for cheap. While record-setting cold temperatures are chilling most of the country right now, Chicago winters are known to be particularly harsh. Despite the acclaimed "MacBook-shape" of the roof, it’s unknown how designers and engineers involved with the project didn’t see how it would be a problem. "The Brits thought we Americans didn’t know about culture and we thought the Brits didn’t know how to draw," is how Robert A.M. Stern describes his impression of the first (pre-Beatles) British invasion. In 1962, Norman Foster, along with Richard Rogers and their respective partners, moved to New Haven for a year to study at Yale. 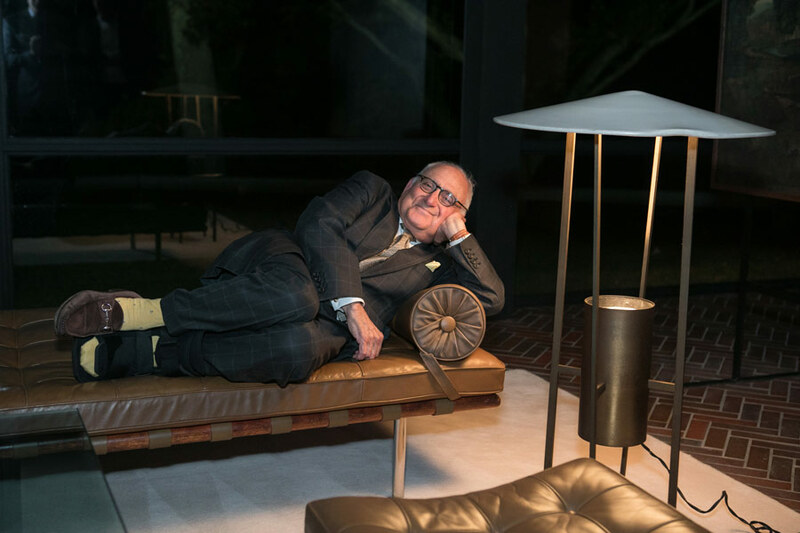 Stern spoke about these years last week at a dinner with Foster on the luxurious grounds of Philip Johnson’s Glass House in New Canaan, Connecticut. The event allowed attendees to walk around the grounds of the estate in all of its fall beauty before the dinner talk. Foster took advantage of this by sprinting with his family through several of the Johnson pavilions. Stern, with his foot in a brace, preferred to lounge in the house with a martini and talk to Peter Eisenman. The conversation, moderated by Johnson scholar and Glass House Chief Curator Hilary Lewis, also covered the two architects' relationship with Philip and his "startling" Glass House, as well as Paul Rudolph and the Yale faculty. They both remembered Rudolph’s demanding studios, particularly his juries that might include the likes of Serge Chermayeff and Vincent Scully who all had a "powerful presence on the campus." Stern described a studio design by Foster and Rogers that apparently did not impress the jury. The scheme was for a science center, on the edge of New Haven that featured a central pedestrian spine with "ziggurat-like "laboratory clusters spilling down hillside." Rudolph, Stern said, “did not like the project, and Johnson snapped off one of the towers and said, 'these will have to go.'" Stern was at his quotable best all evening and claimed that Foster "has not gotten better, because he was perfect as a student." Foster was particularly impressed with Scully who, he said, "brought history alive for me for the first time." Today's visit to the Glass House, he concluded, made him realize that the New Canaan residence owed its siting to Wright who, Scully claimed, wanted houses "to disappear into the landscape." (Stern claimed that Wright once asked Johnson, derisively, if he was "still building little boxes on the landscape," but Wright nevertheless came to the Glass House to drink martinis.) Foster realized that in fact the Glass House was "not a little house on and above the land, but in fact disappears into the landscape," an observation made clear by the tranquil twilight talk. Stern and Foster agreed that today, it’s hard to describe how shockingly new the Glass House was to their generation. "I was one of the first students to visit the house," Stern said. "I did not know Philip Johnson, but I called him on the telephone, and he said, 'bring the boys down!' And I showed up with seven women..." The conversation ended on a more serious note as Foster promoted the goals of his private foundation in Madrid that address issues like climate change and the fact that a quarter of the world's population has no access to electricity, difficult topics he thinks the profession of architecture avoids. He finished by stating that, for most of the world's citizens, infrastructure is more important than architecture. Stern agreed with Foster’s assessment of the architecture profession and claimed that most of today's star architecture "is about individual ego and not context, [not] a continuation of the street or the history of the city." Stern sent the audience off to dinner with one of his quotable bon mots: "I like New Canaan but I wouldn’t want to live here." Stern and Foster were sent home with an official snow globes from the design store of the house to remember the evening. 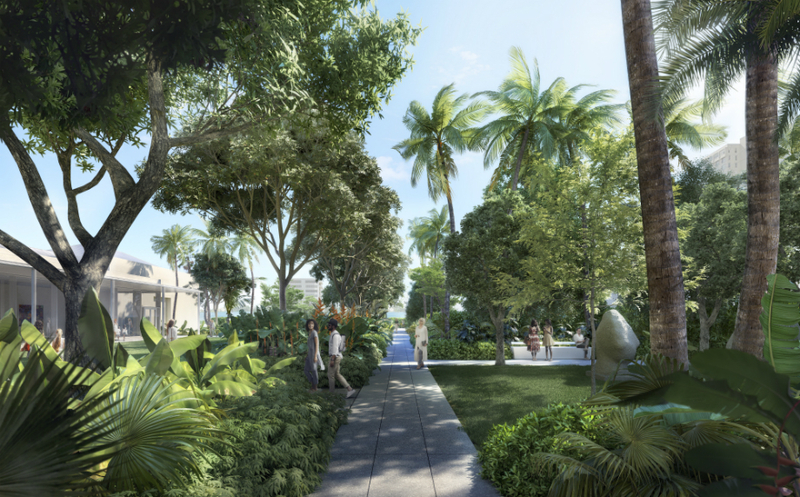 Foster + Partners has designed sub-tropical green spaces and a sculpture garden as part of the $100 million expansion of West Palm Beach’s Norton Museum of Art. The new landscape will be composed of native flora and is based on the spatial concept of the masterplan—a series of 1941 Art Deco-inspired pavilions—by creating a series of “garden rooms” formed by trees and plantings. Each room will have a thematic sculpture grouping, with works by artists like Keith Haring, George Rickey, and Mark di Suervo. Pritzker Prize-winning architect Lord Norman Foster called it a “museum within a garden” in a statement. The campus’s native trees and flowers will create shaded walkways, while a great lawn will provide an open-air venue. The design includes eighty-two mature trees, including eight mahogany trees brought in from around the state to be planted on site. At the center of the design is a banyan tree that was part of the original 1941 design. It will anchor the entrance while the roof of the museum curves around it. As for the building extension, AN’s Jason Sayer put it best. “A simple, all-white stone facade and minimalist form stay true to the aesthetic of the 1941 original by New York’s Marion Sims Wyeth, where a subtle Art Deco style creates a central axial courtyard. Later developments meant that the original axial configuration, on which the building was based, was lost.” The extension is Foster + Partners’ third building in Florida, and was unveiled in 2013, broke ground in 2016, and is set for completion in 2019. From Michael Bloomberg to Olafur Eliasson, figures from the worlds of design, business, art, academia, and government all gathered in Madrid’s Teatro Real on June 1 to discuss nothing less than how to save the world, all under the auspices of the Norman Foster Foundation. The forum was titled “Future is Now,” and the primary challenges discussed were climate change, rapid urbanization, failing infrastructure, and global inequality. In his opening remarks, Foster stated that the pressing needs of the built environment “are far too important to be left to one profession.” Over the next few hours, the diverse selection of panelists explained how each of their fields could make a contribution, whether it was flying drones that could lay bricks, or models for large-scale water-infrastructure management. (See The Architect's Newspaper's full coverage of the Forum here.) The day was a call to action—Alejandro Aravena said that “cities could become social ticking time bombs” and “shortcuts to inequality”—as well as an overarching manifesto and debut event for the Norman Foster Foundation, which is based in Madrid. The foundation features an archive of Foster’s sketches and models, educational programming, an in-house architectural team, and a design and technology office that will conduct research into advanced materials like carbon fiber. The Foundation is totally independent from Foster’s firm, Foster and Partners, and has a mandate to tackle the loftier challenges outlined at the forum. It will also helm its own architectural projects, such the Droneport that debuted at the 2016 Venice Biennale of Architecture and is slated for a town in Rwanda. The facility, a series of spaces encased by brick domes, aims to be a vital hub of trade and supply for remote settlements. If successful, it could serve as a prototype for similar projects across the continent. The Foundation itself occupies a stately 1902 residence about a mile north of the Museo del Prado and Madrid’s city center. While almost all its programs are housed in the historic building, the Foundation also designed what it calls a “Pavilion of Inspirations,” a large glass-and-steel gallery that holds a collection of objects and artworks that inspire Foster—including Le Corbusier’s 1926 Avion Voisin Lumineuse car, a futurist sculpture by Umberto Boccioni, dozens of airplane and automobile models, and two designs by Buckminster Fuller, who was Foster’s mentor and collaborator.